Good variety with elevation, requiring distance and control. Dual tees at most holes. New holes added in 2015. From Delaware; north on Rte. 23 for 5.5 miles to Delaware State Park entrance on right. Follow main park road to Sweet Gum Grove. 1st tee faces toward Delaware Lake. This course has no photos. 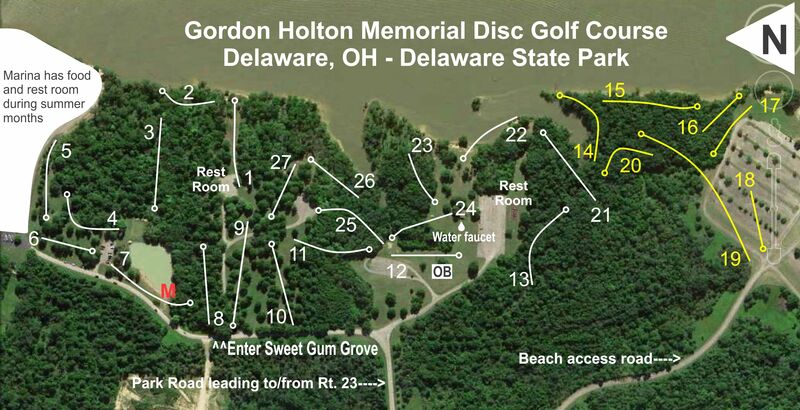 One of my favorite long tee layouts in ohio. Not so much from the shorts! I throw a lot of overhand throws myself and I find it to blend all the talents of a disc golfer. Fore hand, rollers,thumbers and backhand ! Shooting even is a good round!!! The only reasons this isn't a 4 for me are some of the holes get a little ground hog day on you with the trees and if you're not a backhand thrower good luck! It is however a beautiful place well cared for, a little more signage would be nice for guidance. With some blind pins and no "short" or "easy" holes not great for beginners but if you're seasoned and up for a challenge def worth the drive to play. As a tomahawk player this course just does not work with me. It is well maintained and very picturesque in parts and my backhand playing friends like it a lot but it does not allow much variety of style. Played the course for the first time today and really enjoyed it. Great variation of shots and extremly well manicured. The only problem we had was trying to navigate the course. Signs would help guide players to the next tee. Best course I have come acrossed in Ohio yet. Amazing change in variation on every hole, scenery is amazing, one hole is completely surrounded by trees, very challenging. Pros: great variation, free to play, great scenery, challenging, well kept cons/ I don't have any for this course. If you can get there then play it. I would travel an 40 min to play there any day. The perfect course. Another gem of a course here! I only found out about it close to a year ago, but its a great place to play. Lots of variation in the holes.